I've now put a week at work between myself and two weeks of winter fun in Norway. Two distinct flavours of fun; first a week of Nordic touring (fun in an alternative sometimes non-fun kind of way) and then, hard on it's heels, a week of downhill skiing with family in tow (fun in a more conventional, fun-fun kind of way). As I write my feet have stopped hurting, the holes in my heels have filled up nicely and two angry purple toe nails are about all that's left to bear testament to my foot nightmare. A pointed reminder of earlier lessons that plastic boots made on a last of the average (no doubt average Italian) foot don't work for my far from average (non-Italian) feet. Feet aside, from the ankle upwards, everything worked just fine and saw me admirably through the whole arrangement. That there was any skiing at all in the second week was a small miracle: this is the first holiday we've taken AK (for the uninitiated that's Anno Kid) that's actually been anything like a holiday! Both mum and dad got to put in a couple of hours a day on the boards. In turn rather than in company but expectations were nevertheless hugely surpassed. Not that the kids didn't try their best to scupper things, although they've not been sick for months, both were either sick before leaving or sick during the holiday. I'm sure they conspired to be so: “Okay Benjamin, we leave for Norway next week, I'll contract an inner ear infection three days before we're due to fly if you do your impressive diarrhoea trick when they get you in your new ski suite. Deal?”. Lay folk think that kids start from scratch and learn as they develop. I now know otherwise. Kids know as much as we do from birth and just gradually admit to knowing more so we don't get suspicious. If they sense an opportunity to throw a spanner in the works they'll be reaching for a Cr-V-Mo drop forged adjustable the moment you look away. It turns out that kids and skiing are a better combination than I'd dared to imagine. I have to admit that I was a little concerned about Emily's reaction to lessons. She's not started school yet and taking instruction is something she's niether well practised in nor well suited to. Mix that in with a few spoonfuls of reserved character and caution when confronted by all things concerning speed (bicycles etc.) and an expectation of obstinate refusal to take part was hard to suppress. 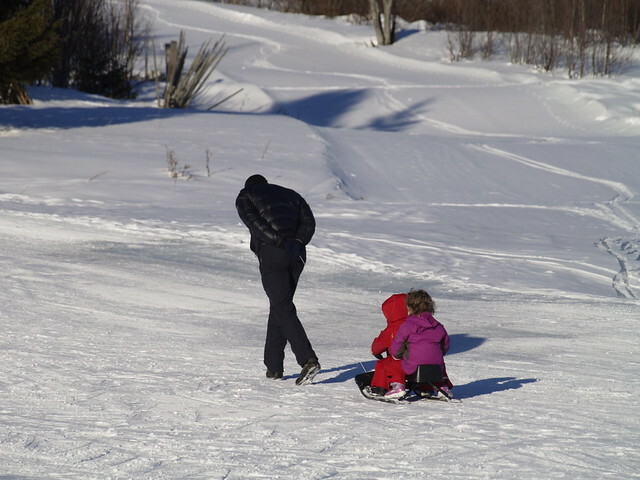 To my surprise, apart from the occasional up-welling of a three year olds DON'T-WANT-TOs (foot stamping is at least made somewhat more difficult when wearing boots and skis) it all went swimmingly. So much so in fact that after three days she was ploughing down the nursery slopes whilst eating chocolate biscuits with a look of nonchalant aplomb. Relaxed skiing by anybodies standards! 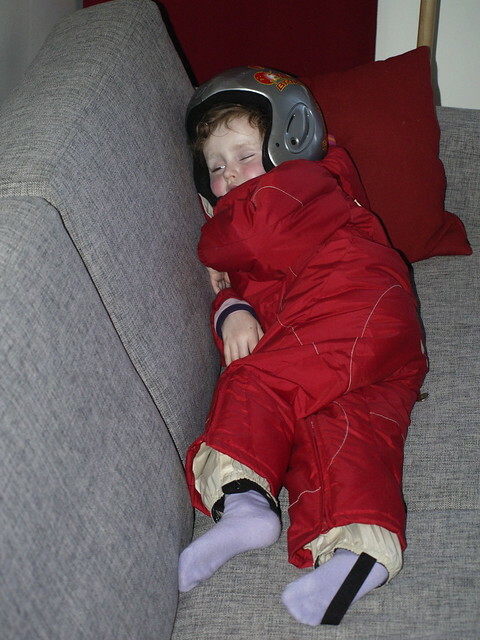 Benjamin, though too young for lessons, and although we, being pushy parents, tried him on skis anyway, found diversion rolling around in the snow like a dog and in his amazing all-singing-all-dancing, hitech sledge. 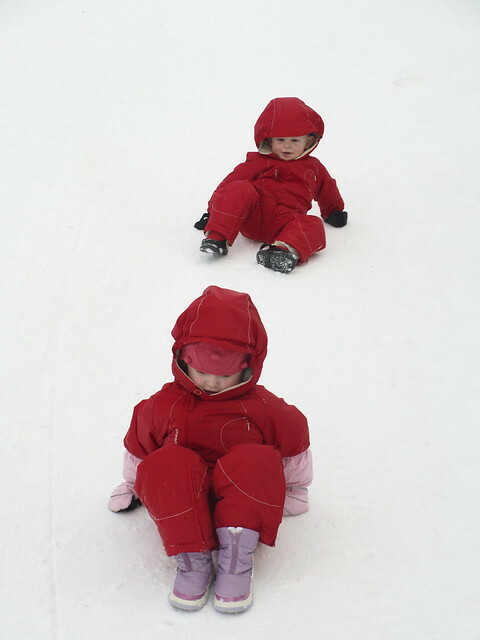 (my steadfast opinion that the traditional wooden sledge is the only real sledge was severely put to the test! 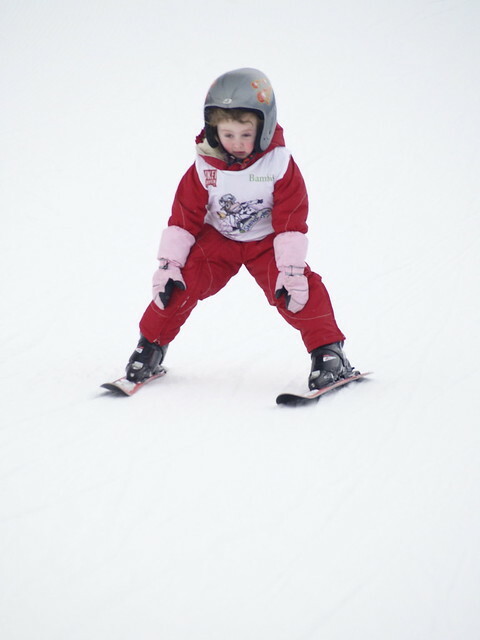 ).We already fear the worst for Benjamin's first ski lesson. Stretcher bearers at the ready! On the amongst-the-outdoor-fraternity-much-maligned subject of lift-served skiing I'm also changing my opinion. I saw its good side in Skeikampen in mid May. In these days of inactivity and creeping obesity seeing young and old, often as not whole families, toddlers to grandpas, spending long days active in the outdoors is a heart warming sight. Yes it's commercialisation of the outdoors but so is the ugly monster that the gear industry has become is it not? Yes it puts a bunch of unsightly ironmongery in places where we should least want it to be but I wonder, can the books be made to balance? Perhaps some level of infrastructure is acceptable in the light of creating safe, accessible environments for young and old to enjoy mountain air, and to sow a seed of enthusiasm for mountain sports in the next next generation? I can't help but feel that Norway has come close to striking a balance with it's modest developments, family oriented attitudes and bring-your-own-sandwiches-nothing-to-do-in-the-evenings approach. Whatever it is it's a million miles from the huge interlinked, apres-ski-hell of the Alps. Whatever the ethics I expect a winter holiday in Norway will become a Hanlon Family standard from now on. There's something for everyone. 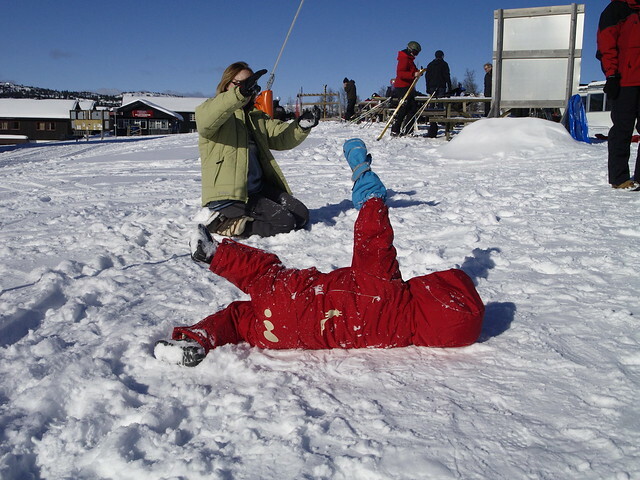 New skills and snow fun for the kids, a chance for parents to charge batteries and, in time, great potential for doing stuff together as a family. For my part, I thought I'd got piste skiing out of my system but the truth is it's still great fun: I can ski harder and more aggressively on-piste than I would ever dare to in the backcountry and that's got to be good for my technique and improve my competence and enjoyment of my backcountry trips. Besides, watching my kids master, at under four, a skill I'm still wrestling with is an addictive pleasure. I'm expecting more tears in my eyes and lumps in my throat for years to come! For now though, we're all skied out. Great post, Dave! Had a good few giggles at the stuff about your kids and their sicknesses, and smiles as I read that the holiday was a success all around (the 2nd week, that is)! Nice post and love the photo's. Love Norway too. Hendrik, Thanks. Glad you enjoyed it. None of the stuff about teh kids is made up I can assure you. David, It's a full time job! Odysee, Thanks. Can't get enough of Norway as you may have noticed.